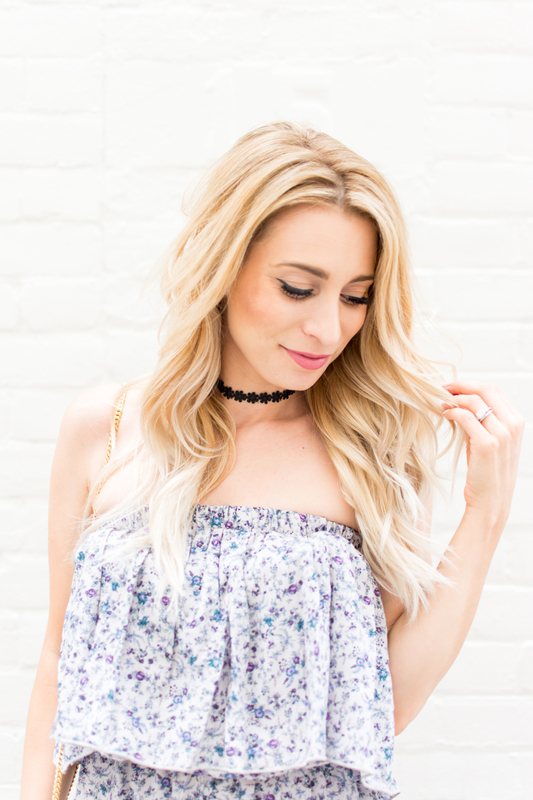 August 2016 | La Petite Noob | A Toronto-Based Fashion and Lifestyle Blog. They say that a picture is worth a thousand words, but sometimes it's what goes on behind the scenes that really tells a story. Take these photos for example; Brian and I (well more me, let's be honest) thought that it would be cool to snap a few pictures by the Toronto waterfront with the gorgeous skyline. Simple, right? After fighting through downtown traffic, getting trampled by hoards of club-goers (this spot is by Cabana, one of Toronto's most popular day-clubs) and nearly being blown away by the wind, we were over it. I think the expression on my face says it all. Thankfully I had my new Hudson jeans that I got from hr2 to keep me comfortable through the whole ordeal. I was asked to come into hr2, an outlet for the high-end luxury department store Holt Renfrew, to pick out a pair of jeans. You guys know that I'm not typically a pants person - plus being petite means that jeans are a bit of a nightmare for me, so I was skeptical that I would find anything. Little did I know that I would actually have a hard time choosing between pairs! The selection of denim for Fall at hr2 is amazing, and the staff were so helpful which is nice to see for a high-end retailer. I finally settled on these black Hudson jeans with some cool knee-details. Regular over $350.00 CDN, these jeans were marked down to $95.00, which would allow me to keep my record of never paying over $100.00 for jeans. I may turn into a denim-head yet, and I'll definitely be looking to hr2 to help build my collection. What do you guys think? Are you a jeans-girl, or do you prefer dresses? Have you ever had a photoshoot that has turned into a comedy of errors? Let me know! With the days getting shorter and retailers stocked up with fall clothing, it can be easy to lose sight of the fact that we still have plenty more of summer left to celebrate and memorable moments to create! I'm all for making the most out of the hot days that we have left, and plan on milking every last bit of summer! In the interest of celebrating the season, here are 5 bucket list items I plan on doing before summer ends. 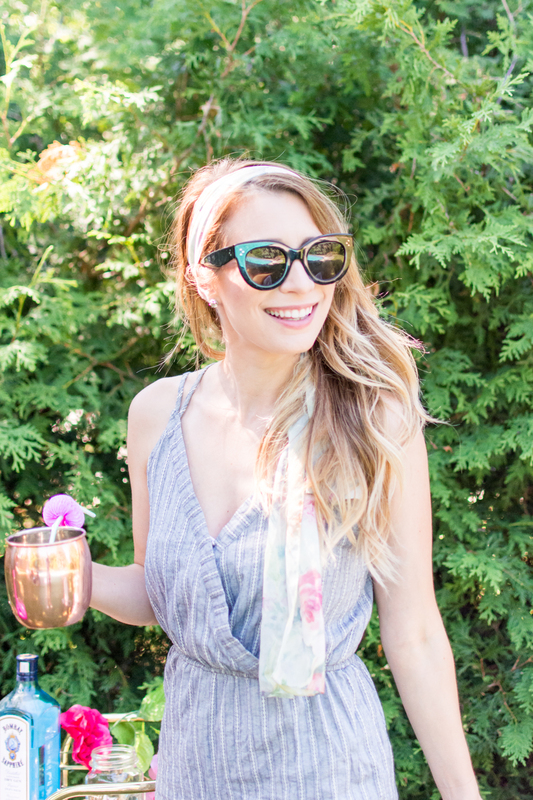 Just because we're mid-August, doesn't mean that I'm done with picnics. There is something so serene about grabbing your BFF, partner or some girlfriends and laying out a blanket in the park for a picnic. Bonus points for picnicking a little later on in the day - shorter daylight hours means that you have a high chance of catching a summer sunset. Gorgeous! Summer tends to fly by in the blink of an eye, and I for one have not yet been to a sandy beach - not even once! Before autumn rolls around I'm making it a priority to hit up a city beach, bikini and towel in-hand, for a fun day. My favourites to visit in Toronto are Sugar Beach or HTO Park, or if I'm feeling up for a drive then I love Sandbanks Provincial Park in Picton, Ontario. City beach or not, I'm definitely going to feel some sand on my toes before the summer is up. Although Toronto is very much a bike-cultured city, there is nothing quite like a summer bike ride. Before fall arrives I intend on blocking out a few hours to devote to a leisurely bike ride, without running any errands along the way. For those of us who are intimidated riding on city streets (me), I take my bicycle down to the Toronto waterfront for a beautiful (and traffic-free) ride. Oh city life - so many of us live in condos with balconies and never seem to use them. I for one definitely don't take full advantage of our little balcony oasis in the summer, and often regret not doing so in the winter. For the remainder of the summer, I plan on using my balcony at least once per day; whether it be to enjoy my morning coffee or for a relaxing patio dinner. For those of you who follow me on Snapchat (username: lapetitenoob), you would see that I have been absolutely loving going to outdoor summer concerts this season. Not wanting to this to end, I will definitely be adding more summer shows at the Molson Canadian Amphitheater to the agenda before the season is over - and I will be doing so with American Express Canada and Amex Invites. Not only do you get to breeze past the massive lineups that inevitably occur with outdoor music venues, but you also gain access to the Amex Lounge which is a slice of heaven on a hot summer day. My last experience with Amex Invites saw me shaking my bon bon front row with Mr. 305 himself - Pitbull, where I was wearing this exact outfit! The evening was right in the middle of one of Toronto's most brutal heatwaves, but the cranberry soda waters at the Amex Lounge kept me cool all night long. It was a night that I will remember forever, and I'm so excited for all the other memories that are yet to be created this summer with Amex Invites. Even though summer’s winding down, I also learned that Amex Invites opens the doors to upcoming events all year around from last fall’s Hunger Games movie screening to a live Dave Matthew Bands show. So whether you’re a music fan or theatre buff, Amex Invites has such fun and diverse events that can keep you entertained all year long. What do you guys think? Do you have any items to add to this end-of-summer bucket list? What was the last outdoor concert that you attended? Let me know! Thank you American Express Canada for my memorable moments. This post was sponsored by Amex Canada. The views and opinions expressed in this post however, are purely my own. 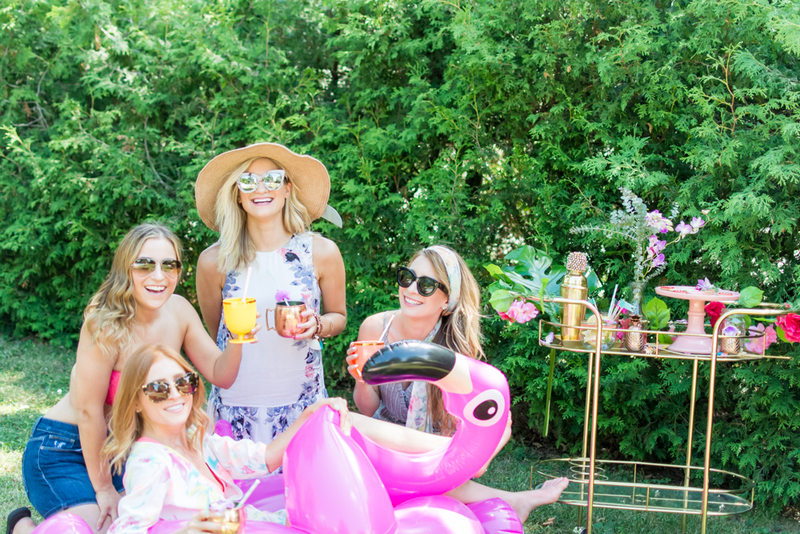 What happens when you put together 4 bloggers, some amazing local products and a pool? Blogger pool party, of course! 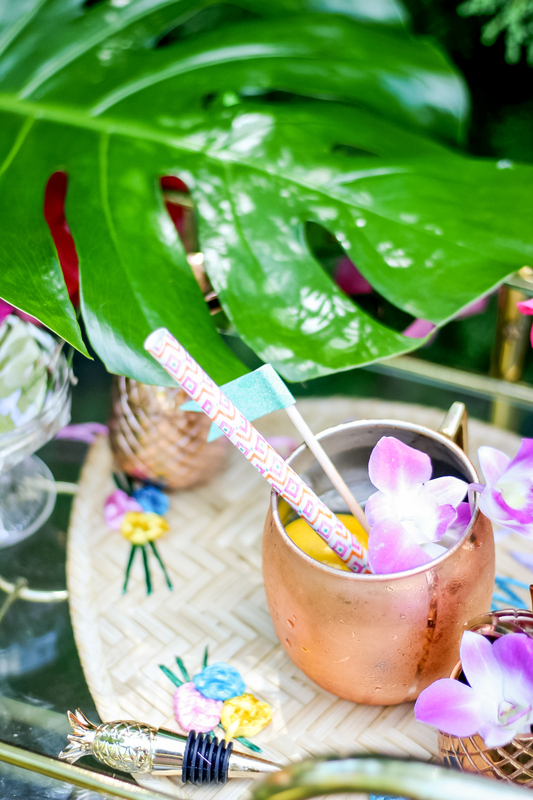 When Gabriella of Pastels and Pastries invited us to her stunning backyard oasis, we couldn't say no; we had the BEST day doing what we love doing most - styling products, taking outfit photos, all while eating, drink and floating in the amazing pool. Bloggers, amirite? We couldn't have done everything alone. 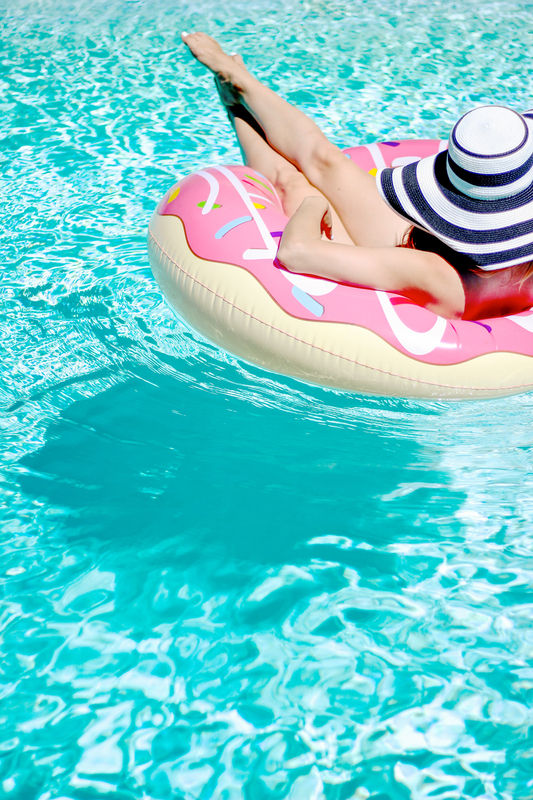 The amazing donut and flamingo pool floats that you see? 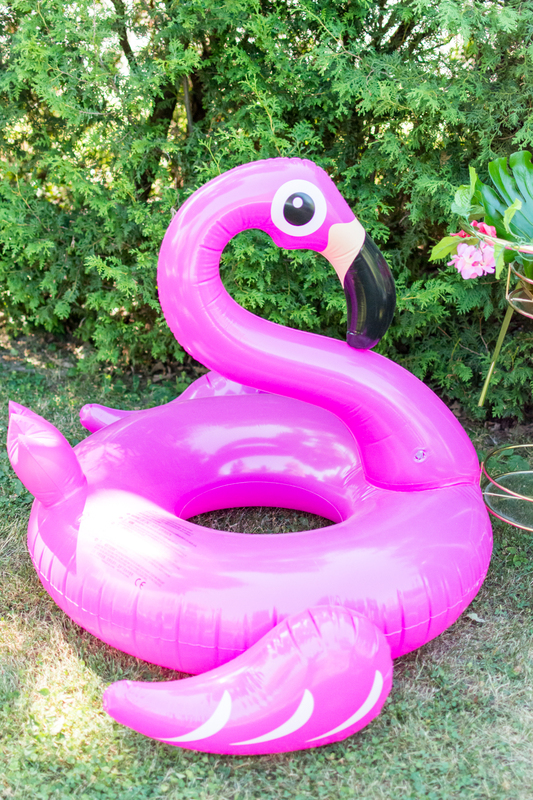 Those can be found at Chapters Indigo, and let me tell you - there's nothing more luxurious than floating around, drink in hand, in an adorable pool float. It was enough to make these Toronto girls feel like we were in Palm Springs. 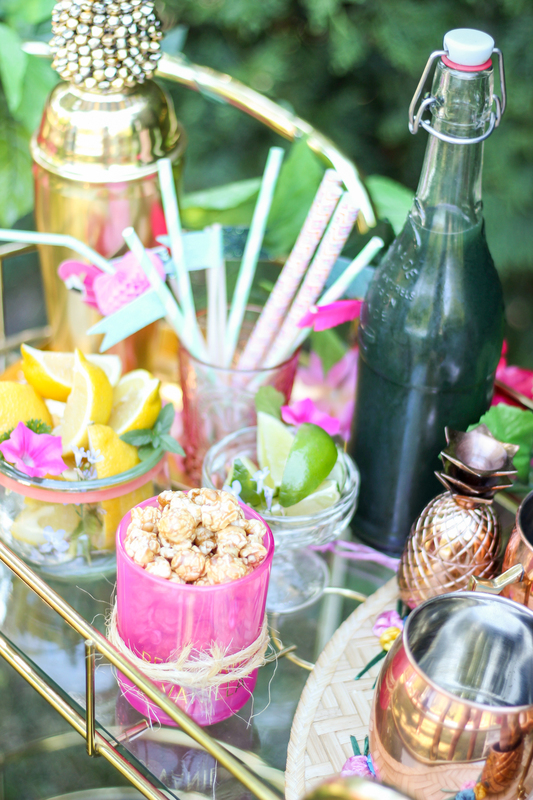 Whats a pool party without refreshments? 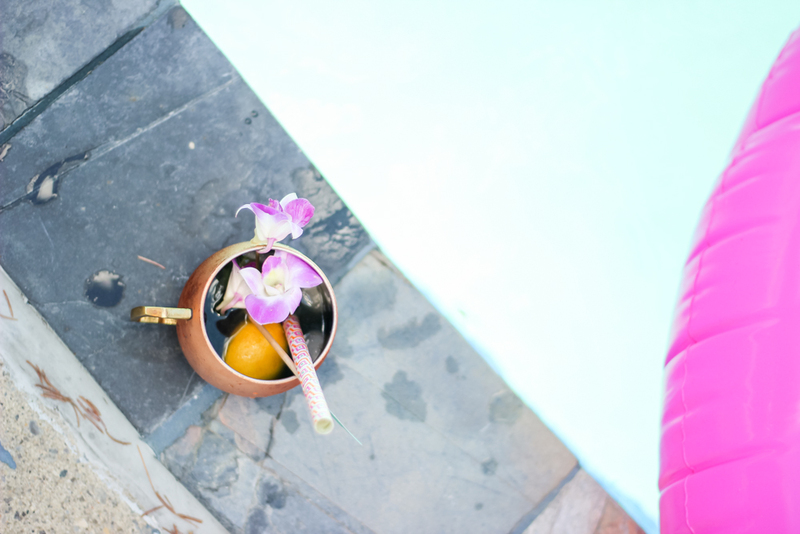 Poolside drinks were made with fresh, cold pressed juice by The Fix & Co. Honestly, I am typically not one for cold-pressed juices but the smooth and slightly sweet mix that we were provided with was amazing. I had never thought about mixing a cocktail with cold-pressed, healthy juice but they turned out amazing! Balance, right? 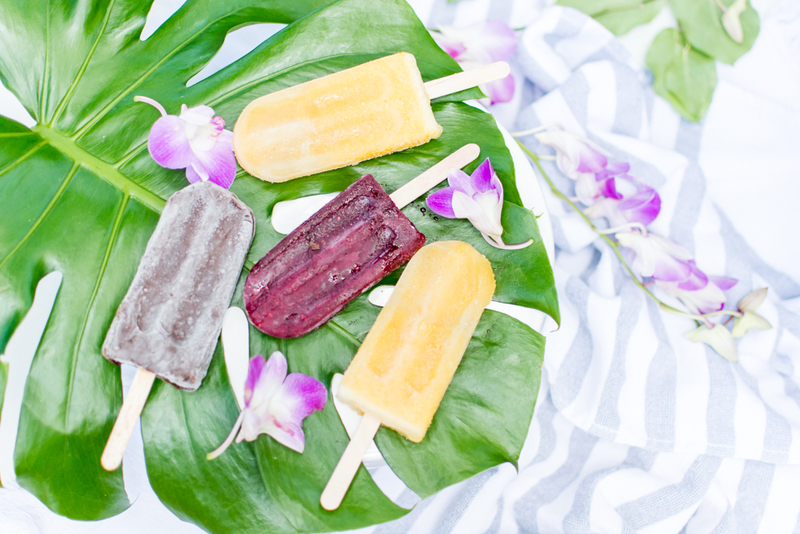 Speaking of balance, we also enjoyed some healthy popsicles from the same juice shop. When things taste so good, it's easy to forget that they're healthy! 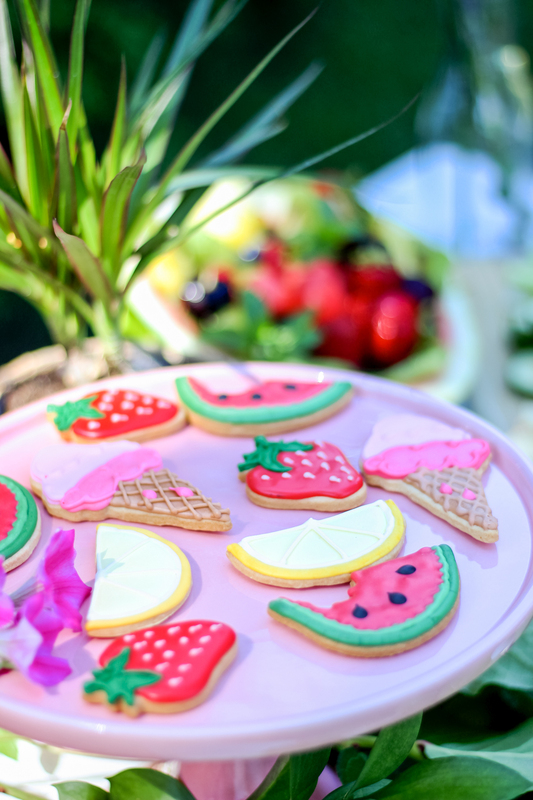 Can we talk about those adorable sugar cookies? The Dessert Lady hooked us up big time with the most incredible poolside sweet treats that actually tasted as good as they look! Recognize the other ladies in the shoot? You guys know Gabriella of Pastels and Pastries and Eleni of Bijuleni, but meet Jacki of Something About That! I'm always so humbled to be around these beautiful and creative ladies. 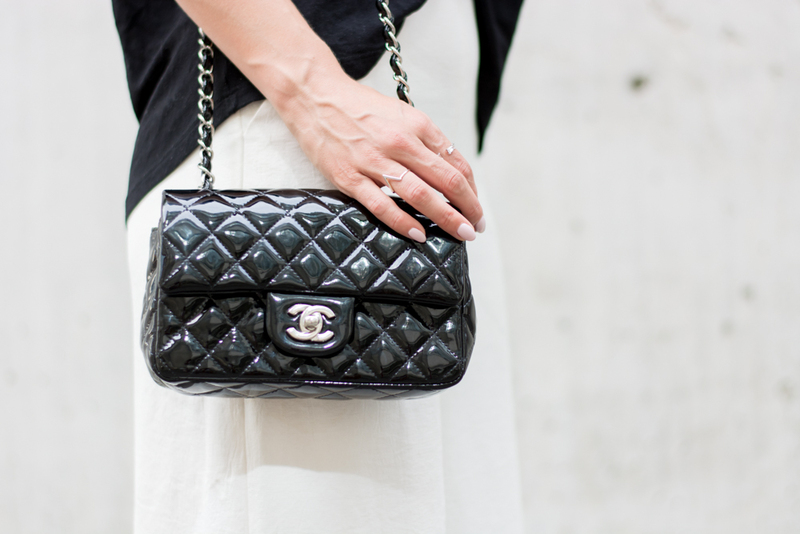 Definitely be sure to check out their blogs for your weekly dose of inspiration and beauty! What do you guys think? Have you ever held a pool party? What are your pool party essentials? Let me know! Thank you so much to Chapters Indigo, The Fix & Co and The Dessert Lady for making our day so much fun!